Many months ago, I had this idea: I thought that it would be fun to write a nature guide of some kind. I wanted it to be for families, and to have lots of really practical and accessible information. But I also wanted it to be fun, and to have experiments that would bring the facts to life by letting kids get hands-on and maybe even a little bit messy. And, I thought that Dawn should probably be my proverbial partner in crime on the project, because she knows way more stuff than me and is also very good at keeping me from getting um, unfocused. She said yes, and before long that one project turned into about twelve, some of which took on lives entirely of their own. It turns out that we work really well together. Some of those projects are still in the works, not yet ready to share. But today, we do have something to present to you all: our first e-book. The Weather Watcher's Handbook: A Family Guide to Weather Science is a family-friendly guide to the wild world of weather and the basic science that makes it all work. It is full of bright and beautiful photographs, fun facts, and activities and experiments that show the science in action. If you are raising kid scientists who are curious about the workings of the natural world, this is the book for you. You can find out more about the book by visiting the Mud Puddles to Meteors blog, or by visiting the pretty new page that we made for the book here. Say Hello to Mud Puddles to Meteors. We had one of those days around here today. Two kids just enough under the weather to be especially grumpy and unconvinced that there are, indeed, nicer ways to be. That sort of thing. But, it was still a good day in many ways, because a fun and interesting and very cool thing finally happened. After a lot of behind the scenes toiling away on things like photo editing and writing html, Dawn and I have officially launched our collaborative nature blog. I first met Dawn a number of years back when the two of us were both regular contributors to a family oriented nature blog that has since fallen off the internet. The other folks involved had various big life changes come along, and in the end, Dawn and I couldn't keep it going on our own. But we stayed in touch, and it wasn't too long before we started working on little projects together here and there. Fast forward a bit, and we now find ourselves working on a few pretty huge projects together. And texting one another approximately one thousand times a day about everything from dinner planning to frog catching. And today, one of our top secret projects is finally ready to share with all of you. Mud Puddles to Meteors is a landing place for families who aim to raise nature literate kids who regard the world around them, and its many wild inhabitants, with a sense of wonder and respect. A place where a community can grow and thrive around the concept that the space between the natural world and ourselves is much narrower and less real than we make it out to be. That really, there is only one world, and it is the one that we are raising our children in, alongside the other creatures that also call it home. And, the new blog will also be a cozy spot for me to let loose with some of the more nature and science types of activities and ideas that rattle around in my head. I can nerd rant over there, and do more of the waxing philosophical about baby pajamas over here. So, I hope that those of you who are engaged in the raising of nature loving and adventure minded kiddos will visit the new space and join in the fun. We would love to see the blog foster a vibrant community of families and educators, sharing what the nature in their little piece of the world looks like and the ways that they are interacting with it as a part of every day life. Good, good stuff. Kitchen Table Science: Simple Chromatography. As far as easy science activities go, this is a reliable standard that I think has earned its place as a go-to project for times when something quick and super easy is called for. The basic idea here is exploring the science of chromatography through the use of everyday household materials and really, it couldn't be simpler. Essentially, chromatography is the process of separating chemical mixtures into their individual parts along a stationary piece of material so that it is possible to observe the different components of the mixture. Ink works especially well for basic chromatography because as much as a given color of ink appears to be one uniform color (red looks, well, red), inks are actually mixtures made up of many different colors together, and it is possible to separate out the individual colors. Begin by cutting the paper towel into strips. We used strips about 1 1/2 inches wide by 5 or 6 inches tall. Choose a handful of ink colors you'd like to try out. This activity is generally done with different black inks (because they really are the most fun in many ways) but my daughter was more interested in colors, so we chose a wider variety of pens to use. Anything will work, really. Using a different color of ink for each strip of paper towel, make a mark on each one that is about the size of a dime. Place each strip into a clear glass jar or drinking glass, and add about a half inch of water to the bottom of the jar. Make sure that the water doesn't touch the ink dot directly and that it sits below the dot in the jar. The water will begin to wick up the strips of paper towel, and you'll see that the ink begins to "move." As the water rises up the paper towel pieces and they get wet, the ink will begin to move upward with the water. What's interesting here is that the uniform ink mixture will begin to break apart. Darker colors, which are heavier, will stay at the bottom of the paper and the brighter (also lighter) colors will move up. Leave the pieces of paper towel in the jars until the water has wicked all the way up and the strips are completely damp. Set the strips aside to dry, and then take a few minutes to observe them. What colors were the inks made up of? Did some inks separate better than others? I touched on it a bit already, but the basic idea is this: most ink is actually a mixture of different inks and can be separated into its individual components. When it is exposed to the paper towel and given the help of the wicking action of the water, the ink mixture begins to separate and the individual inks that make it up behave according to their individual properties. Heavier colors (the darker ones) will stay near the bottom of the paper, lighter ones (the lighter colors) will rise to the top. Kitchen Table Science: Multi-Colored Liquid Density Experiment. Wow. That title is a bit of a mouthful, eh? But the good news is this: this experiment has become a kid-science standard because it is actually quite easy to execute, is a great introduction to the concept of liquid density and, it looks pretty when you are done. An all around winner. Begin by filling the larger jar with about 1/4 cup of the dish soap. We happened to have some green dish soap on hand, so I used that and then didn't need food coloring in this first layer. The colors of each layer aren't important, but the order in which you pour the liquids really is. Also, pouring liquids slowly and through a funnel proved to incredibly useful and I'd definitely recommend that. Mix 1/4 cup of water with food coloring of your choice. We used blue because we thought that it would work nicely against the green dish soap. Using the funnel, slowly pour the water into the jar on top of the dish soap. Next pour 1/4 cup of vegetable oil into the jar on top of the water and soap. Pour this slowly and carefully so that you don't disturb the other layers any more than necessary. The vegetable oil is difficult to mix color into, so don't bother. Just leave it in its natural state. You can see here that pouring the vegetable oil into the jar did disturb the layers a bit, but this is the beauty of this experiment. As long as the layers aren't totally mixed into each other by the force of the next liquid pouring from above, they should sort themselves out (which is both fun to watch and the entire point of all of this). Finish up by mixing red food coloring into 1/4 cup of rubbing alcohol and then carefully pouring this solution into the jar. This will leave you with four layers in the jar. They will be a bit muddled from the pouring action, so set the jar aside in a well lit location where you can watch the layers begin to separate more cleanly. Within a few minutes of being set aside, you should be able to see very distinct layers in the jar. Cool, yes? Different liquids have different densities (mass per volume) and therefore, different weights. The heaviest liquids will sink, the lighter liquids will rise to the top. So, dish soap is heavier than water which is heavier than oil which is heavier than rubbing alcohol. And we all just learned something new- awesome! Alphabet Glue: Volume Eight is Here! I will not lie to you all, it was in under the proverbial wire this time around. But, it does indeed look like I pulled it off: Alphabet Glue Volume Eight is officially available. And, it has the added bonus of being super fun. As in, comic books and easy science experiments and handcrafted field guides kind of fun. Lots of very favorite things in this one. Visit the Volume Eight page to find out all about what you can expect to discover inside the latest issue of Alphabet Glue and to download a copy of your very own. 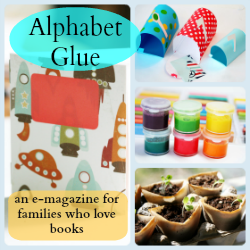 Alphabet Glue: The Summer Science Special! Sometimes, I get an idea in my head, and I just can't get rid of it until I do something with it. It is my very own, super special brand of crazy. A few weeks ago, I was chatting on Skype with Heather, as I sometimes do late in the evenings when I'm trying to avoid doing less fun, more productive stuff. And, I was telling her about his idea that I had, but that I really had no time to work on. "You should totally do it" she said. A couple of days later, I was talking on the phone to Dawn, and again, I mentioned that I had this thing that I really wanted to do, but that I didn't think I could really pull it off considering that the baby completely stopped sleeping about a month ago, meaning that we are wholly without sanity around these parts. So, I was setting the idea aside for the time being. Maybe next summer. Fast forward a bit, and here I am, telling you all about The Summer Science Special, a science-themed mini-issue of Alphabet Glue. It would seem that I just couldn't help myself afterall. Plus, when I mentioned that I wanted to do a special issue wholly dedicated to science, Mariam turned out to be remarkably enthusiastic and ended up helping me with pretty much every step of the process. She even took some of the photos for the tutorials herself this time around. Inside The Summer Science Special you will find a small collection of classic science projects perfect for bringing just the right amount of busy to summer afternoons, when the young folk around your house might be feeling just a little restless or in need of something fun to do. And don't fret dear Southern Hemisphere friends- I think that you'll find that the activities in this issue work equally well in the winter! You can find out all about The Summer Science Special and download a copy of your very own (just $2.50!) here. Kitchen Table Science: Lava Lamps. I will begin by acknowledging that until now, this has not been the sort of blog where I exhort you to go out and purchase a box of Alka-Seltzer post haste. But folks, that is all about to change. I'm not sure how many of you are already familiar with Steve Spengler Science, but if you are at all the sort of person who likes to make reasonably sized messes out of household items in the name of scientific experimentation, you probably should be. Mariam has to present a science experiment in class this afternoon, so yesterday we tried these homemade lava lamps thinking they were a possible contender. Well, they win. The basic idea is this: you mix 3 parts oil with one part water and ten or so drops of food coloring in a container with a tight fitting lid. At first, the food coloring will just kind of sit in tiny blobs at the bottom of your container, attaching itself to the water as it sinks. The jar turns into a do-it-yourself lava lamp! Once the bubbling from the Alka-Seltzer has stopped, put a lid on the jar and turn it in different directions to see big, fun blobs of color move around. I suspect it would be awesome to look at with a flashlight in the dark as well. To read more about the details of the experiment as well as why it works, check out this page on the Steve Spengler website. I think that there is even a fun video to go along with the whole deal. Enjoy! Kitchen Table Science: Food Coloring Surface Tension. A few weeks ago, Mariam and I were at a birthday party and somehow or another, the subject of this experiment came up. One of the other parents asked for the necessary materials (which are few and usually already on hand) and we turned the experiment into an impromptu party trick right then and there. It was a huge hit, of course, because this is one of those incredibly simple experiments that yields delightfully surprising results. Start by pouring a small amount of milk into the plate so that the entire surface is covered with about a quarter to a half inch of milk. Dot a few drops of food coloring around the plate, noticing that the drops sit on the surface of the milk, mostly without moving. Next, randomly add a few small drops of the dish soap to the plate. Just for fun, Mariam and I made a little video of what happens when you do this (because seeing it actually happen is much cooler than looking at a picture of after it's already happened...). You can check it out by clicking below. So, why does this happen the way that it does? It's all about surface tension. The food coloring is less dense than the milk, so it sits on the surface and is mostly immobile when you add it. However, the dish soap immediately begins breaking down the fat molecules in the milk, changing its density and reducing the surface tension. This allows the food coloring to start moving through the milk, making the swirling effect. I would call it good, clean fun except for the fact that it involves food coloring, which is pretty much always trouble. Nevertheless, enjoy! Kitchen Table Science: Eggshell Salt Geodes. I had been meaning to post another Kitchen Table Science project for some time now, and since I owed The Magnifying Glass a bit of love and attention as well, I went ahead and posted it over there. If you are on the hunt for a little science experiment that's ideal for an easy afternoon around the house, hop on over and check it out. Oobleck is arguably considered to be the classic small person science experiment. That and the bit where you sprout bean seeds in wet paper towels. However, I think that it Oobleck is not to be discounted just based on its overwhelming popularity. It is much, much too entertaining for that. In fact, I'm pretty sure there is a reason why this stuff has endured so well in houses and science classrooms alike for so very long. If nothing else, it is extremely messy (which kids love) and ridiculously easy to clean up (which adults love). There is also the added benefit of being able to go as far down the path of nerd-dom as one might ever want to with this stuff that is both liquid and solid; oobleck is the perfect introduction to states of matter, non-Newtonian fluids and all that good business. Or, it can just be fun to play with. As evidenced above, Mariam couldn't keep her hands out of the bowl long enough for me to get a picture of the oobleck doing its magic thing as a solid. Mix the cornstarch into the water a 1/4 cup at a time, taking care to dissolve lumps. When you get up to about 1 1/2 cups of cornstarch added, you might find it easiest to just begin mixing with your hands rather than a spoon or whisk. Add up to 2 cups of cornstarch, stopping when your oobleck comes together into a smooth mixture without left over water sitting on the top. Although oobleck is essentially just a suspension of cornstarch in water, it originally got its fancy name from a Dr. Seuss classic where a sticky, gooey liquid comes from the sky. It's classic Seuss, part ridiculousness and improbability, part morality tale. A couple of drops of green food coloring or tempera paint added to the basic oobleck recipe should get you a perfect companion substance for the reading of this book. Another great book that would complement the oobleck making quite nicely is What is the World Made Of? from the Let's Read and Find Out Science Series. It's a clearly written book with a subtle sense of humor and easy to understand descriptions of the states of matter. A perfect choice if you want to get a little more science-like with this experiment and start discussing just how weird it is that oobleck behaves both like a liquid and a solid and crosses the boundaries between states of matter. Speaking of which, if your kids are old enough to understand the concept of matter in a more detailed way, you might take a look at this great resource on oobleck. The author goes a little more in depth about non-Newtonian fluids, a fancy name for a very cool thing, and also has a video clip of oobleck in action that is extremely weird and fun to watch. Note: Just make sure that you don't leave your kids unattended with the cornstarch after watching that video or you'll find them dancing around in a bathtub of oobleck before you know it.